Colombo (Sri-Lanka) 16 March - Special Representative Santos Pais joined representatives from the eight countries in South Asia in a high-level roundtable to discuss and advance national and regional implementation of the violence against children related goals of the Sustainable Development Agenda. 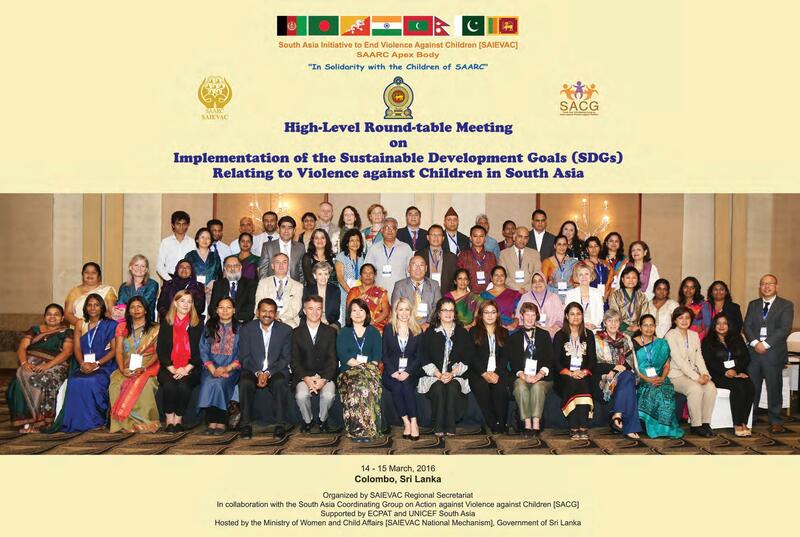 The meeting was organized by the South Asia Initiative to End Violence against Children (SAIEVAC), SAARC Apex Body with the support of ECPAT International and UNICEF, and was hosted by the Government of Sri Lanka. The meeting highlighted the global and universal nature of the new development agenda and the imperative for all countries to ensure progress for all children, with a priority attention to those further behind. Recognizing the important framework provided by human rights standards and the UN Study on Violence against Children and that the SDGs are interrelated and naturally reinforcing, South Asian representatives expressed commitment to promoting the development of a national, cohesive and cross-sectoral strategy to translate the Agenda 2030 into strategic action. They stressed the importance of informing this process with sound evidence and reliable data, to inform policy making and monitor progress. They recognized the need to mobilize firm resources to sustain effective implementation and achieve positive change. The meeting reaffirmed the critical role of SAIEVAC as a regional multi-stakeholder platform to facilitate sharing and cross-fertilization of experiences, to enhance knowledge and skills and to make available the needed expertise and scientific evidence, in support of national development processes and to feed in the global process of follow-up and review of the Agenda 2030. SRSG Santos Pais urged South Asian countries to seize this opportunity to undertake vigorous and urgent action to meet the ambition of the agenda and the urgency of preventing and responding to all forms of violence against children.